NEW StarLock automatic guide rate calibration which analyzes the sky conditions and sets the best possible guide rates for both RA and DEC What's more is that all of this technology and engineering delivers a portable astro-imaging system that can be set up, aligned and imaging in less than 30 minutes. Fast f/8 Advanced Coma-Free (ACF) optical systems on the 10", 12" and 14" OTAs. These optics produce wider, flatter fields with no coma for pinpoint stars out to the edge of larger imaging sensors or extreme wide angle eyepieces. Optional custom-designed LX850 f/5 large-format focal reducer/field flattener also available. 130mm 3-element, air-spaced apochromatic f/7 refractor with 3" Crayford-style 10:1 focuser. Beautifully machined and finished with case. Optional 3" field flattener available. StarLock full-time automatic integrated guider assists with ultra precise drift polar alignment, finds and centers targets and then automatically locks onto a field star as faint as 11th magnitude for one arcsecond guiding. No separate computer, no guide star selection, no user focus. Just setup your camera and image. Internal Crayford-style primary mirror focusing system with a dual speed 7:1 focus control, that eliminates image shift and mirror flop. Precise focus is a snap. 1.75" diameter threaded stainless steel counterweight shaft with 26 lb. threaded stainless steel counterweights for easy and safe adjustments to telescope balance. Meade Instruments all new LX800 Series of imaging/visual telescopes uses exciting advanced technologies in optics, electronics and mechanics to bring you a superior system for imaging and visual observations. Here are some of the exciting features of the LX800 line. New fast f/8 Advanced Coma-Free (ACF) optical systems on the 10", 12" and 14" OTAs. These optics produce wider, flatter fields with no coma for pinpoint stars out to the edge of larger imaging sensors or extreme wide angle eyepieces. Optional custom-designed LX800 f/5 large-format focal reducer/field flattener also available. New 130mm 3-element, air-spaced apochromatic f/7 refractor with 3" Crayford-style 10:1 focuser. Beautifully machined and finished with case. Optional 3" field flattener available. New StarLock full-time automatic integrated guider assists with ultra precise drift polar alignment, finds and centers targets and then automatically locks onto a field star as faint as 11th magnitude for one arcsecond guiding. No separate computer, no guide star selection, no user focus. Just setup your camera and image. New internal Crayford-style primary mirror focusing system with a dual speed 7:1 focus control, that eliminates image shift and mirror flop. Precise focus is a snap. New Precision machined 5.8" main gears with 225 teeth in both R.A. and DEC. with .68" worms for very accurate movements and tracking. New sophisticated built-in computer for the most accurate control of the StarLock and other telescope systems. Precise altitude and azimuth controls for mount polar alignment. New Ultra-stable adjustable height tripod. Three inch diameter legs fold up for easy transport. Internal cabling to prevent snags and tangles. Total Net OTA Weight: 33 lb. OTA Shipping Weight: 44 lb. Main gear - R.A. & Dec. Worm gear - R.A. & Dec.
26 lb. threaded stainless steel. Giant folding adjustable height tripod with 3 inch diameter aluminum legs. Mount body weight 55 lbs. Over 144,000 Objects, Catalogs included: Index catalog (5,386); NGC catalog (7,840); Partial Caldwell catalog (109); Messier catalog (110); Earth orbiting satellites (26); Planets (9); Uppsala galaxy catalog (12,940); Morphological catalog of galaxies (12,939); General catalog of variable stars (29,364); SAO and Hipparcos star catalogs (42,277); Draper star catalog (21,160); Yale bright star catalog (8,977); Large Bright Quasars Survey (1,055); Namd objects (4,313); Herschel catalog (400); Abell catalog of galaxy clusters (2,712); Arp catalog of irregular galaxies (635); Lunar features (1,754); Asteroids and comets (120); Constellations (88); Solar/Lunar eclipses, meteor showers (492). 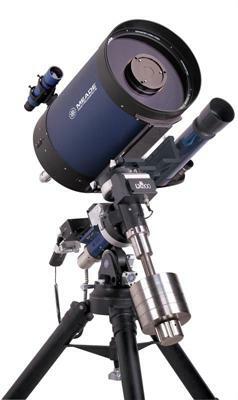 Click the button below to add the Meade 14 Inch LX850-ACF w/UHTC Coatings to your wish list.